Fiat Chrysler Automobiles has announced plans to pump $4.5bn (£3.4bn) into the Michigan vehicle industry which will create 6,500 new jobs. The carmaker said it will build the first new assembly plant in Detroit for nearly three decades. It is a boost to the area after General Motors announced it would shut two Michigan sites as part of a wider restructuring plan costing 14,000 jobs. GM's decision late last year drew fire from US President Donald Trump. The US President has put pressure on the car industry to build vehicles inside the US. GM blamed the move on a shift in consumer preference from sedan cars to larger SUVs. 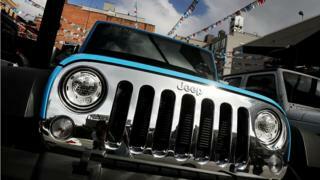 Fiat Chrysler said its investment in Michigan was part of its strategy expand its Jeep SUV and Ram truck brands. The company will convert two of its plants, one of which has been idle since 2012, into the assembly site for its new Jeep Grand Cherokee as well as a new three row Jeep SUV. It will also be equipped to build plug-in electric hybrid vehicles. Fiat Chrysler said that the new facility will be the first assembly plant to be built in the city of Detroit since 1991 when its Jefferson North site was constructed. As a result of the investment across five of its plants in Michigan, Fiat Chrysler said it would now no longer move production of its Ram Heavy Duty truck from Saltillo, in Mexico, to the US. The company had promised to shift production of the model to its Warren plant, near Detroit, by 2020, a move which had won praise from Mr Trump. Meanwhile, the President threatened to "tariff the hell out of" the European Union as part of trade talks which could see the US lift duties on European car imports from 10% to 25%. The US wants to include agriculture as part of the trade talks, but Brussels has refused. The EU wants to negotiate lower car tariffs. In a meeting with US governors on Monday, Mr Trump said: "The European Union is very, very tough. Very, very tough. They don't allow our products in. They don't allow our farming goods in."